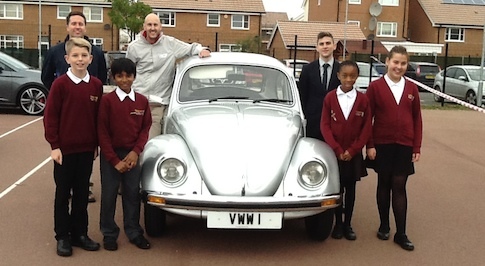 Children at Brooklands Farm Primary School in Milton Keynes have been given the opportunity to explore the world of cars thanks to Volkswagen UK. Members of staff from Volkswagen will be visiting the school and have worked with teachers to adapt age-appropriate curriculum topics for the pupils at Brooklands Farm, giving them an engaging start to their automotive project. The topics will vary, depending on how old the student as, with the oldest children in Year 6 learning about car marketing and how Volkswagen establishes what cars to sell in the UK. In Year 5 they will gain an understanding of how cars are built and then transported across the world. Year 4 will be gathering knowledge on the company's rich history and Year 3 will learn about the aftersales approach. Younger children will also join in the whole-school project with advancing their communication skills by learning how to sell a car. Andy Bannister, Volkswagen Group UK's Corporate Social Responsibility Manager, said: "A global automotive group like Volkswagen clearly has a wealth of information and broad spectrum of roles, specialists and activities in which it is involved. When we were first approached by the school to get involved with them we weren't quite sure how we could share our knowledge and experience but it's been fascinating to work with staff and develop modules for each age group of students. "I'm excited to be visiting the school and seeing how the children engage with the subjects  and maybe they'll remember our visit and these students will be our technical apprentices, sales executives or marketing gurus of the future!" Headteacher at Brooklands Farm Primary, Maxine Low, added: "We're delighted that a local employer of Volkswagen Group's size has agreed to come to our school and we're sure the children will be inspired by learning about the Group and its history and activities. Children learn best when they 'do' and I'm confident that the experiences they gain this week and visiting new places like a Volkswagen Retailer or a technical training centre will stick in their minds for a long time, and enhance their learning."